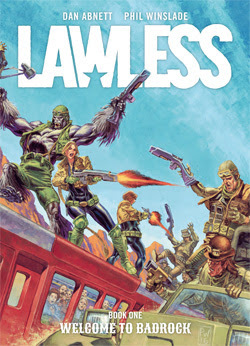 Lawless is in its first collection here from the pages of Judge Dredd Megazine! The first collection of 2000 AD‘s latest breakout success set in the Judge Dredd universe, with an incredible new female Judge. The backwater planet of 43 Rega has spent five years recovering from an invasion of aliens known as the Zhind. isolated and a hotbed for trouble makers, Badrock is an colony township desperate for a strong law enforcer to take charge. Enter Colonial. Marshal Meta Lawson. Tough, surly and determined, Lawson seems to be ideal for the role. But is this law-woman exactly who she claims to be?